Orbit the large Earth Climber as you try to make your way to the top or descend to the bottom. 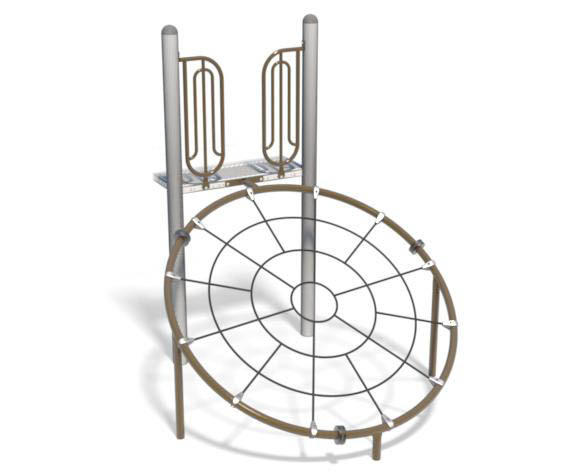 Earth Climber is a mechanical assembly of support frame, legs and net. Support frame and legs are a welded assembly of 2.375” (60mm) O.D. x 10 gauge (3mm) Allied Flo-Coat® galvanized steel tube. Net is a mechanical assembly of 0.625″ (16mm) O.D. round strands of galvanized steel cores. External strands are non-abrasive UV-resistant Polyamide-yarn. Cross points joined with drop forged aluminum ball knots. Steel frame work is coated with polyester powder-coat.